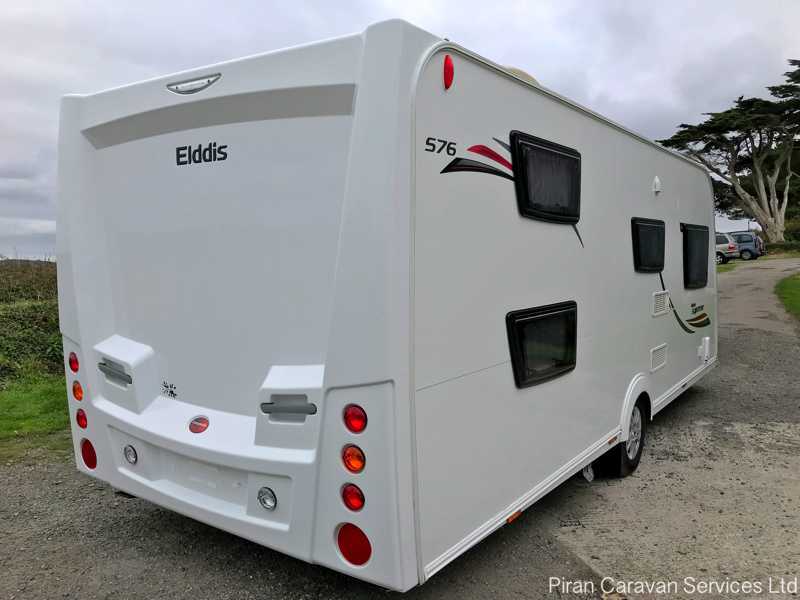 If you are looking for a premium, luxurious family caravan, which can comfortably sleep up to 4 children and 2 adults, this upgraded model 2014 Elddis Supreme 576 could well be is the caravan for you. Another major benefit for a family is the two fixed bunks that can be separated from the rest of the caravan by a privacy screen. It is a single axle caravan with an MTPL of less than 1500kgs, so towable by a mid size tow car, giving accessibility to a family caravan for drivers of who don’t drive massive 4x4’s. 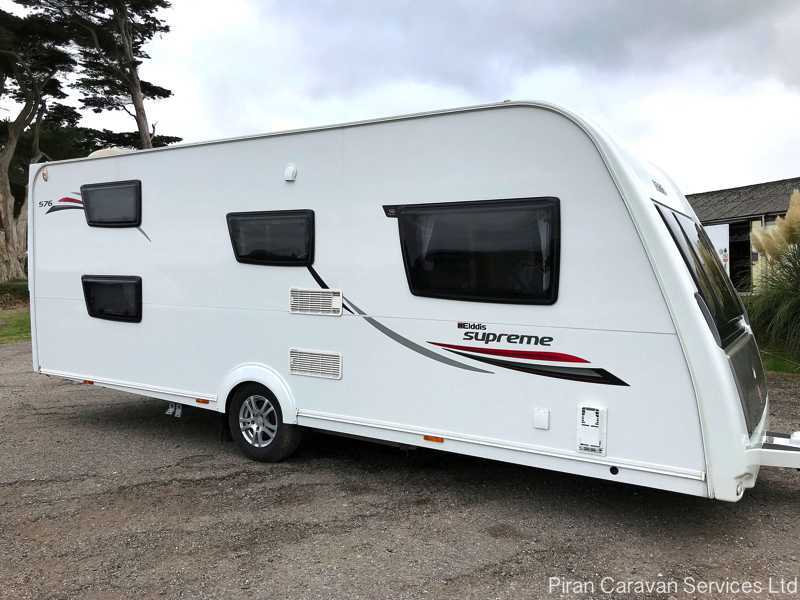 Based on the Elddis Avante 576 but with upgraded trim and equipment, the Supreme 576 has a u-shaped lounge, central kitchen, side dinette, 2 rear side bunks and an end washroom with separate shower and toilet, all on a galvanised single axle chassis. 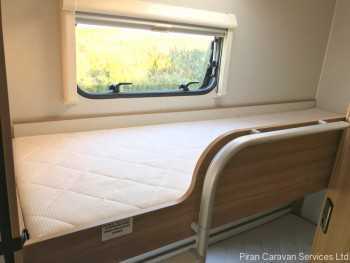 The six-berth layout provides two fixed bunks in the offside corner, a four-seater dining area that makes into a domestic-sized three-quarter double bed, and full single-bed length settees which are longer than most other caravans on the market, at 1.88m (or six feet three inches), these can be made up as a large twin bed. The caravan will be cleaned by us and serviced and damp-checked by an independent approved workshop for peace of mind and comes with a range of extras including an Isabella Commodore awning. 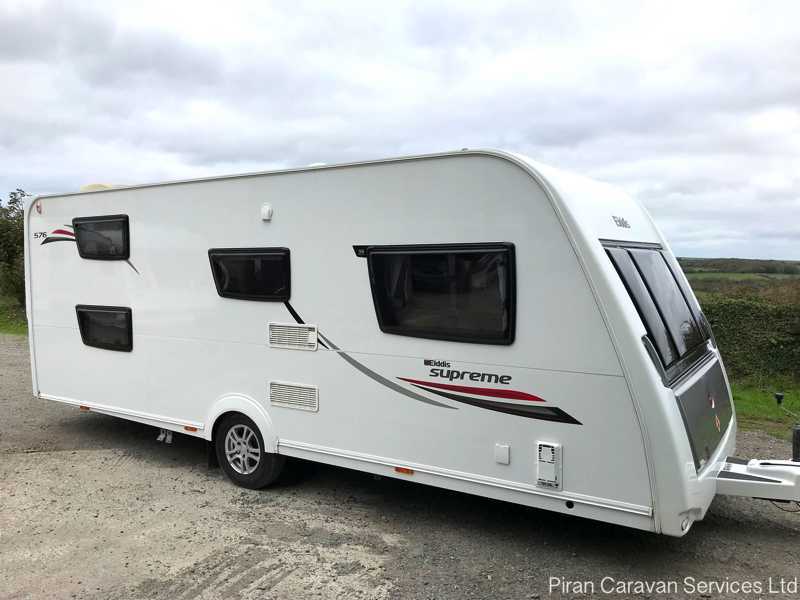 This caravan will suit families with up to four children, who want the option of touring with their caravan, or using it as a holiday home on a seasonal pitch. 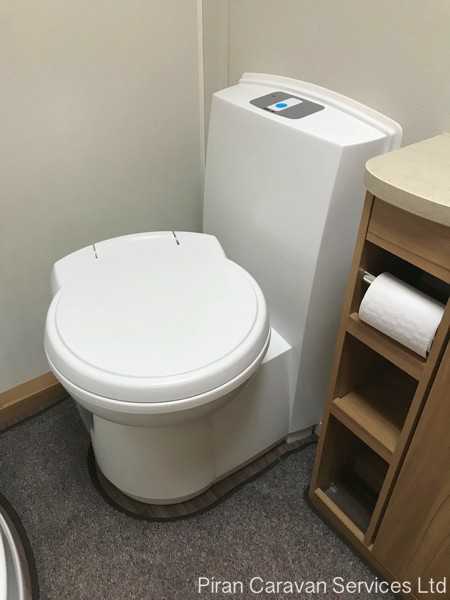 The end washroom makes a very useful private changing area which is not usually found in 6 berths. 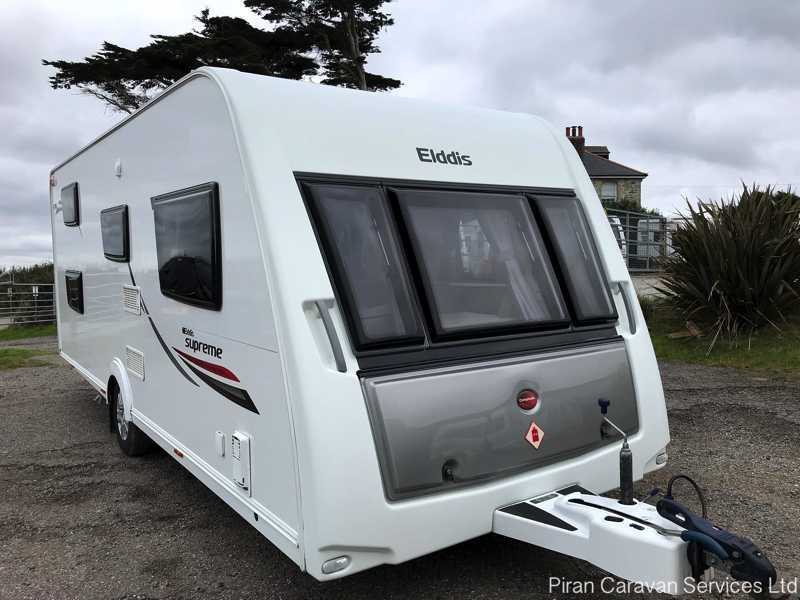 Prospective owners looking for luxury will appreciate the craftsmanship that goes into Elddis caravans. 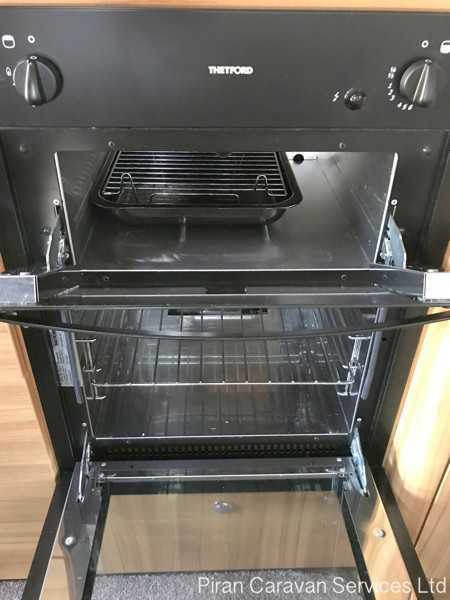 Sharing its looks with the more expensive Affinity and Crusader range, externally the Supreme 576 has the same large acrylic grey gas bottle housing door and shares the same grey and red graphic colours. Elddis revolutionised their construction methods for 2013, with more than 90% of screws and bolts having been eliminated by the introduction of a new SoLiD bonding process developed by Elddis in conjunction with Henkel, specialists in chemical bonding. This new technology that’s exclusive to Elddis is backed by a 10-year anti-water ingress guarantee. 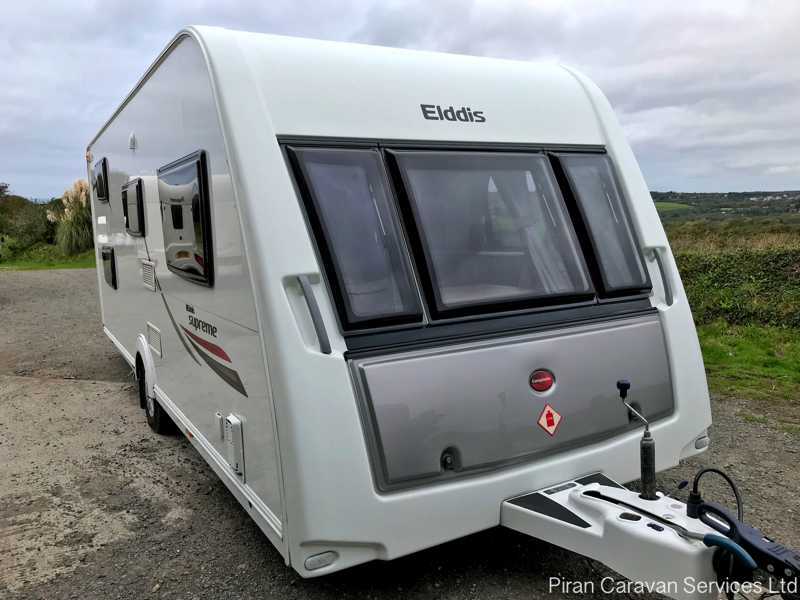 The Elddis range also has a protective layer of glass-fibre reinforced plastic under the floor, to protect the floor from damp, not found in many caravans. The caravan features Grade 3 thermal insulation, ensuring that this caravan can be used year round. 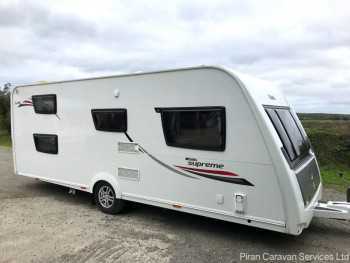 The chassis is the class leading BPW Swing V-Tec chassis with Winterhoff stabilising hitch and an iDC (Intelligent Drive Control) anti-snaking device. 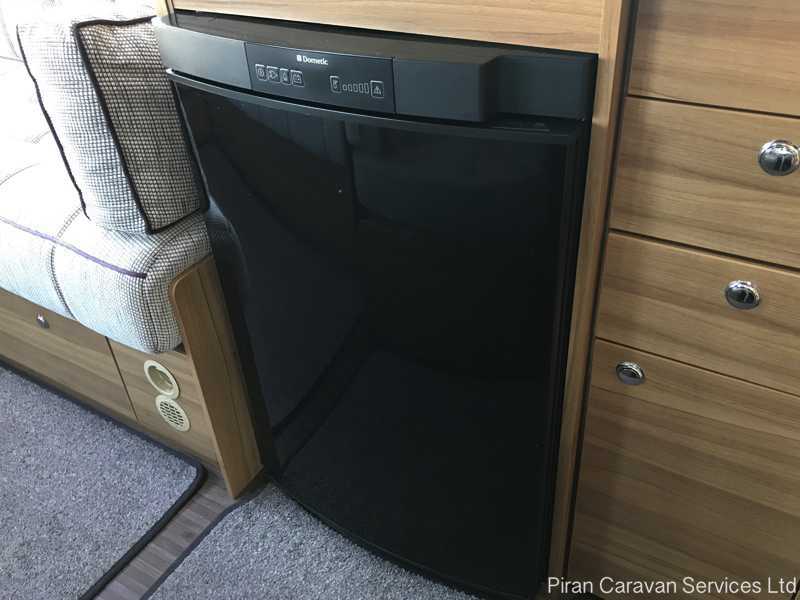 The front panel is stone-chip resistant GRP and the rear panel has streamlined folded rear lights and a high level LED brake light. 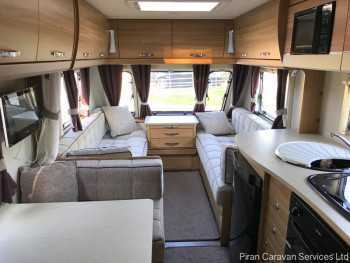 The exterior also features 'Vulcan' sports alloy wheels, a spare wheel in an underslung carrier and smart, stylish exterior graphics. 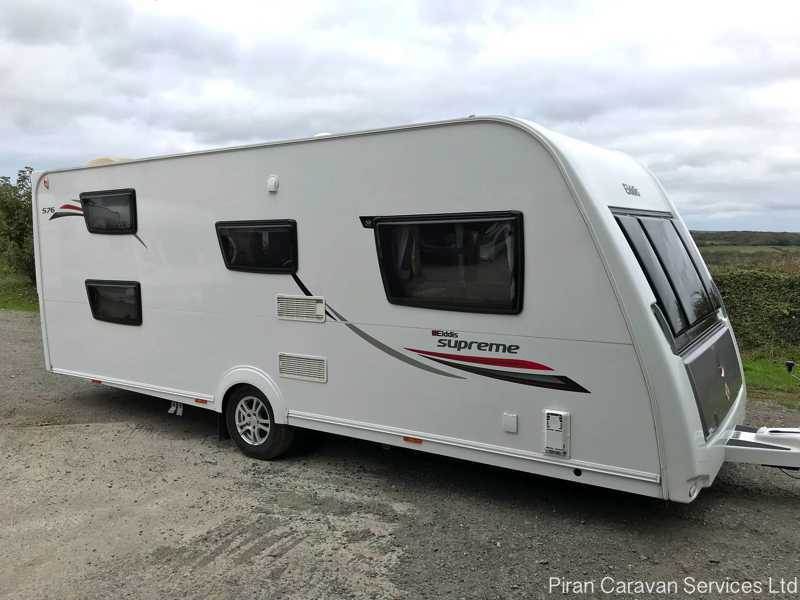 This is a very modern-looking premium caravan with an attractive and commanding presence, whether being towed on the road or sited on a pitch. 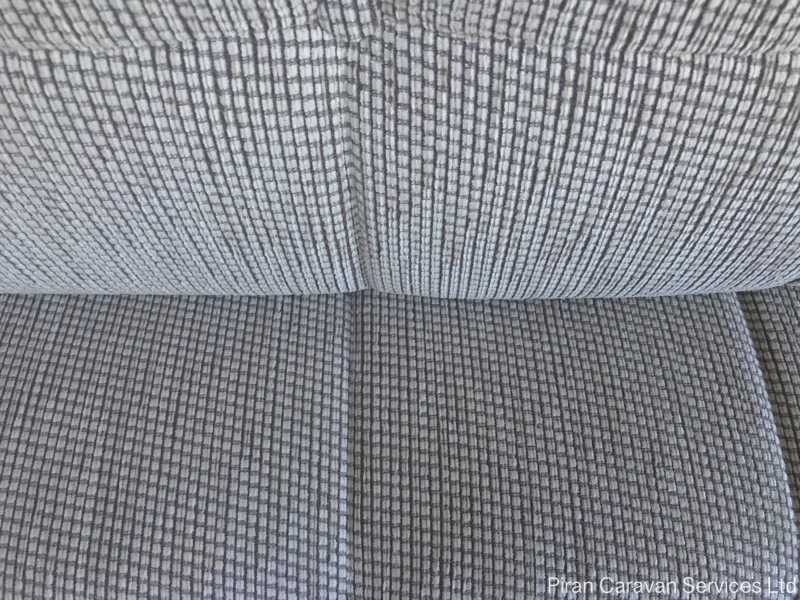 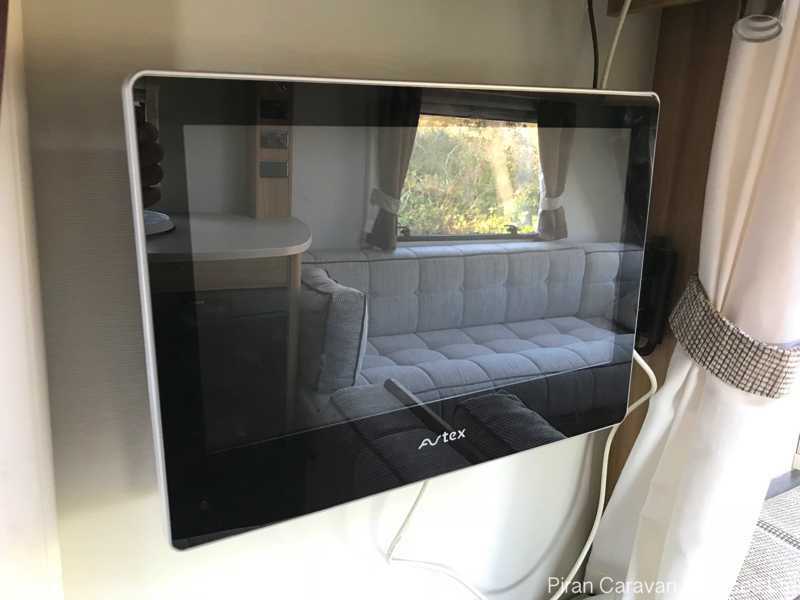 The front section of the caravan has a lounge area with large double glazed panoramic windows, with pleated blackout blinds, fly screens and night ventilation latches. 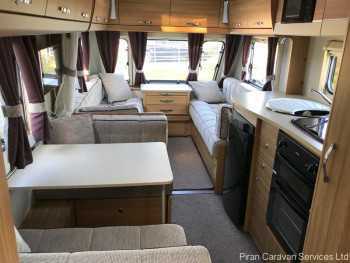 There are aircraft style overhead storage cupboards and a removable chest of drawers with a fold out coffee table. 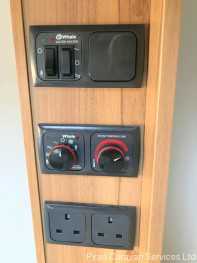 A folding dining table is stored in its own locker. The wooden slats for the pull out double bed roll out from under these drawers. All the cabinetry in the Elddis Supreme is finished in 'Aspley Walnut' and th locker doors have contrasting trim. The areas under the lounge settees are easily accessed by full-length drop-down doors and there is also front access to the storage areas under the dining area seating. 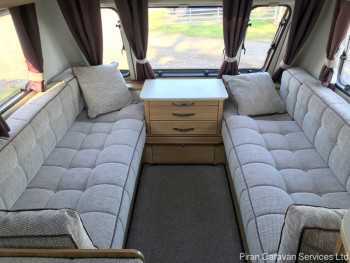 The lounge comfortably seats 4 people. Set into the roof of the lounge is a Heki roof light - this gives the lounge a light and airy feel as well as plenty of ventilation when fully opened. 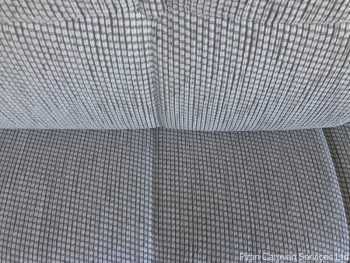 There is a very practical wood effect vinyl flooring underneath the premium drop-in carpets. Moving back through the Supreme 576, the well-equipped offside kitchen will handle all the catering requirements of a family and gives you a gloss black dual fuel hob with a mains 800w hotplate and three gas burners. 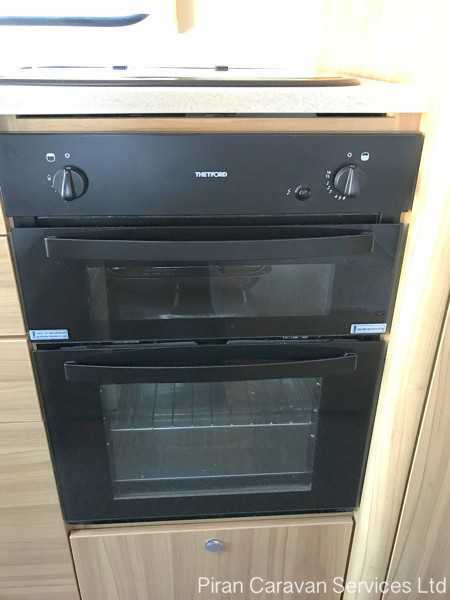 There is also a domestic style oven and grill, plus a gloss black 800w microwave with automatic programme function, with specific buttons for pizzas, jacket potatoes, bread, frozen vegetables and more. 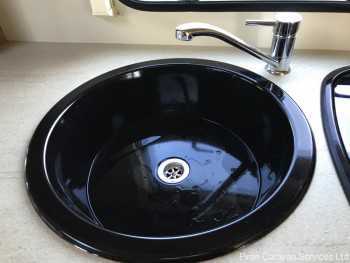 The black enamel sink with chrome finished mixer tap is large enough for the washing-up needs of six people. 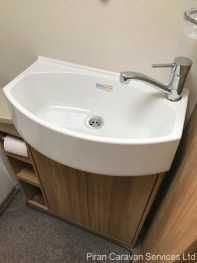 Work surface area includes a worktop extension and is sufficient for food preparation with the ability to use the dining table opposite the kitchen for dishing up. 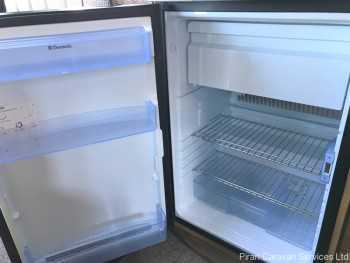 There is also a large 110 litre 3 way fridge freezer for cold food storage for a family holiday. 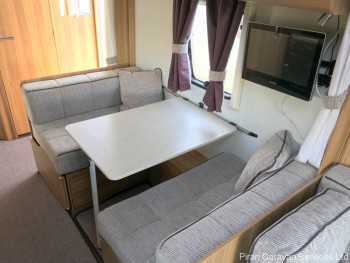 Opposite the kitchen, the wide, four-seater side-dinette area, gives the Supreme 576 so much appeal as it enables the kids to eat separately from the parents. 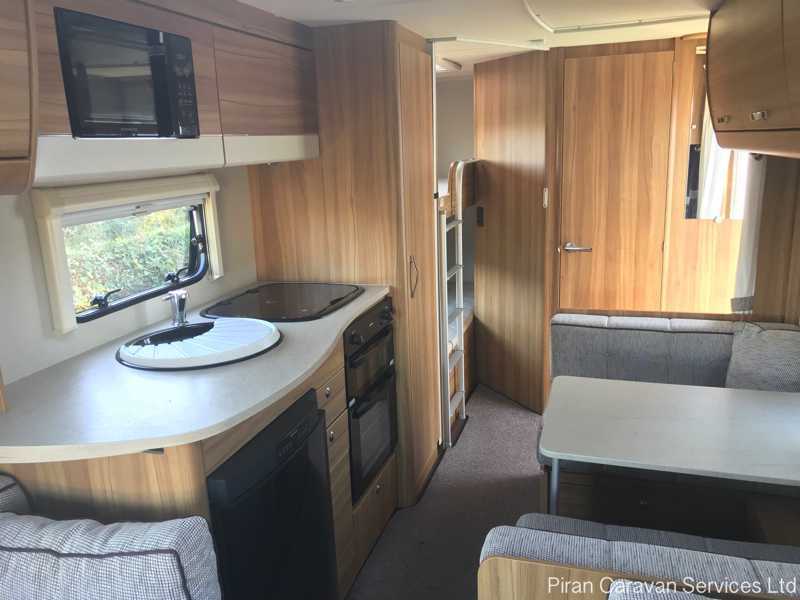 This feature also makes the 576 an excellent choice if there are four occupants because it becomes a permanent dining area. 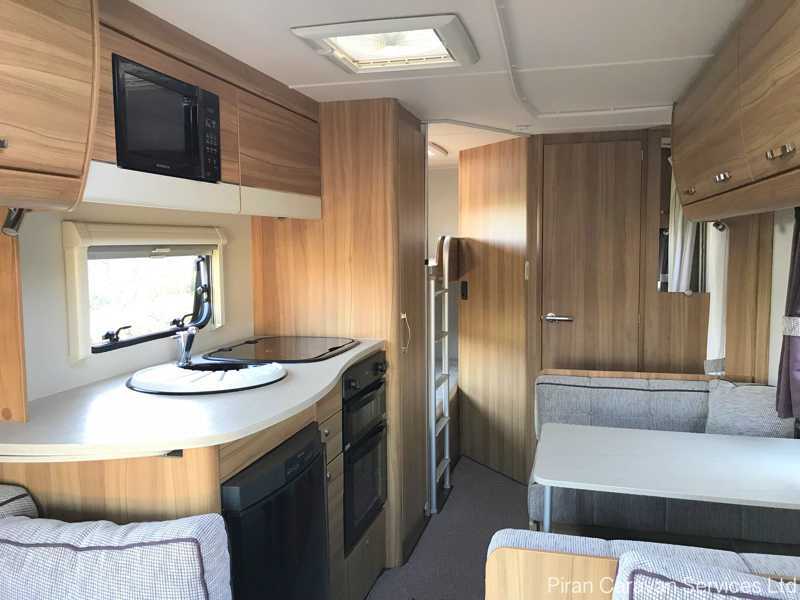 The dinette provides very useful additional living space by day and night, this can be converted into a tree quarter double bed at night. 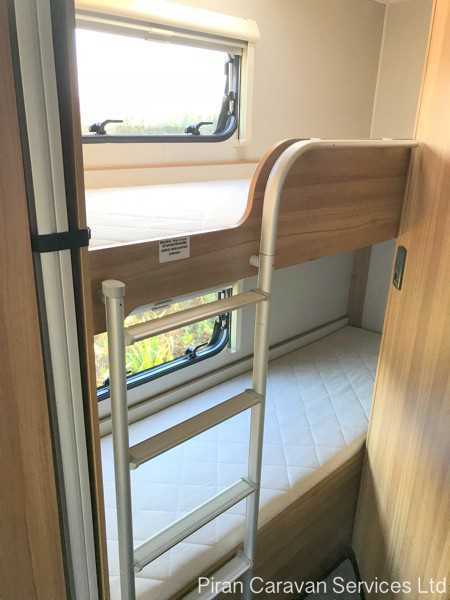 In the rear offside quarter of the caravan are two fixed bunks, with access ladder and safety rails and a privacy screen which can be pulled around the bunks. This is great for families with small children as they can be put to bed leaving the rest of the caravan to be lived in without disturbing them. 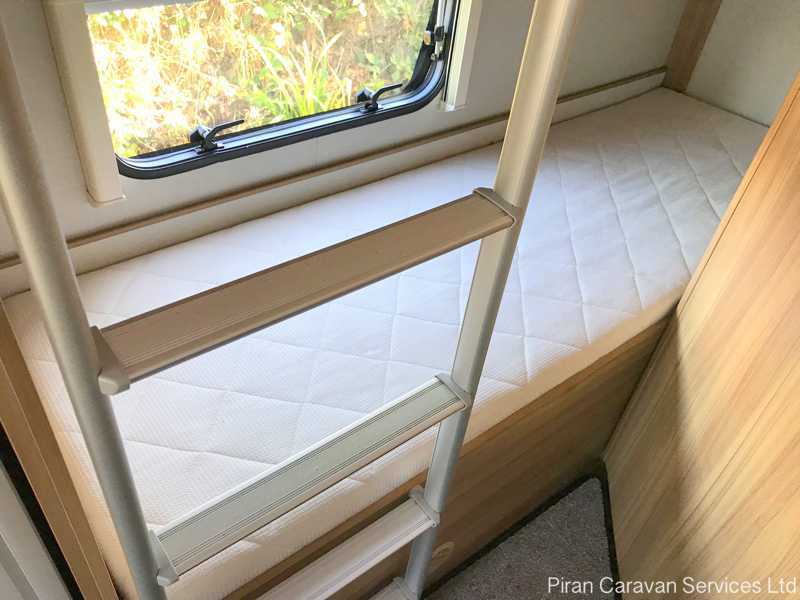 In terms of storage, the space provided is ample: the wardrobe, between the kitchen and the bunks, has two rails, one above the other, doubling its capacity and still leaving space at the base for footwear. 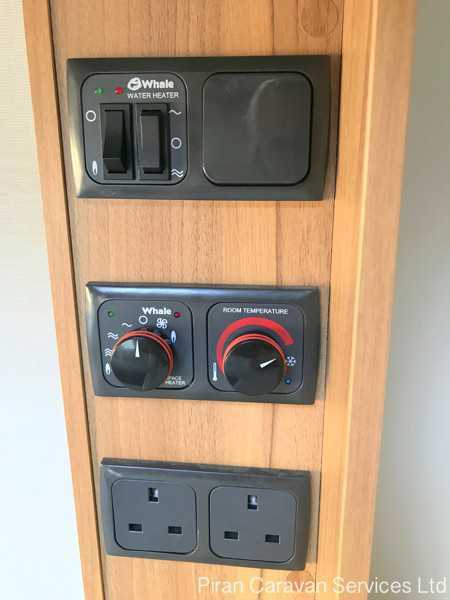 Nine over-head lockers are provided for additional storage. 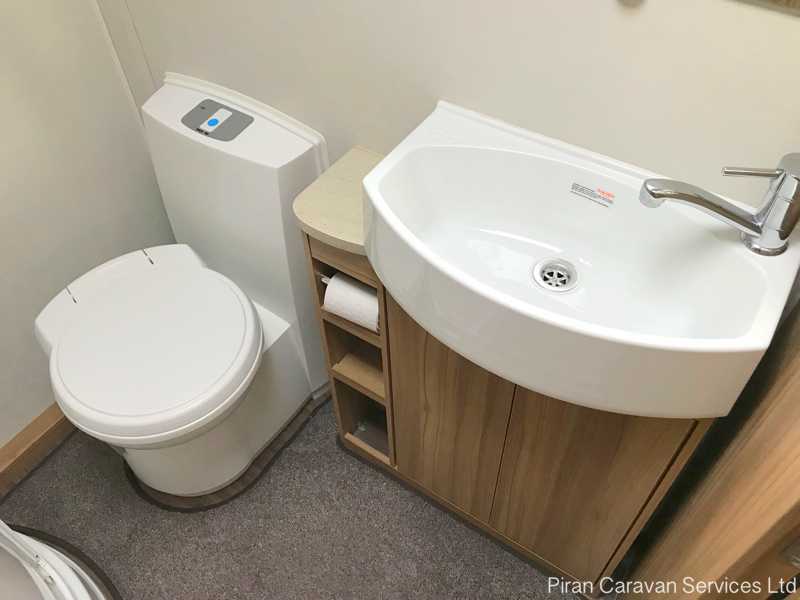 The square wash-room is situated at the rear of the caravan, next to the 2 bunks and has an area cut off to create floor space alongside the bunks. There is plenty of floor space for towelling and dressing, and the shower is large enough for two children to share. 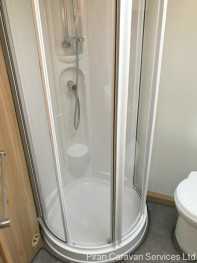 A nice little feature to notice is the soap tray, mounted on the shower rose riser bar; you can swivel it to the left or right to suit you. 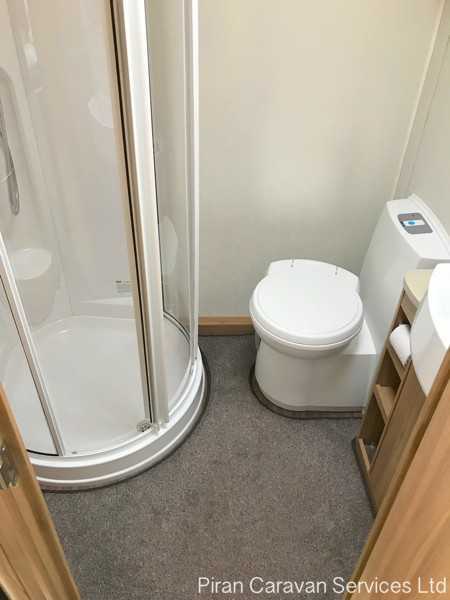 There is also a Thetford c-250 swivelling toilet with electric flush and a wash-basin set into a useful vanity unit, finished in the same Aspley Walnut as the rest of the caravan. An Avtex television with DVD slot comes as standard with the Elddis Supreme 576 and there are two mounting brackets, one facing either the lounge or the dining space and a second near to the bunks; another reason why the 576 is so suited for families with children! 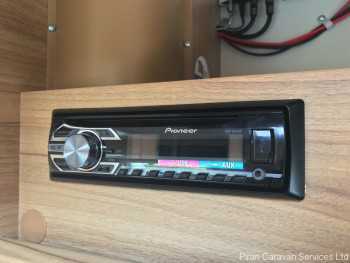 There is also a cd player with Aux/Ipod connection and quality stereo speakers. Lighting is a mix of 12v and 230v volt mains, ambient and task lighting, with energy saving LED bulbs ensuring that the caravan is well lit and cosy at night. 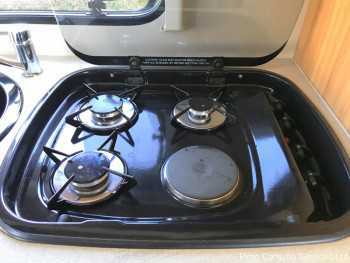 The Elddis Supreme 576 will be cleaned by us, and serviced and damp-checked by an independent approved workshop ensuring real peace of mind for a new owner. 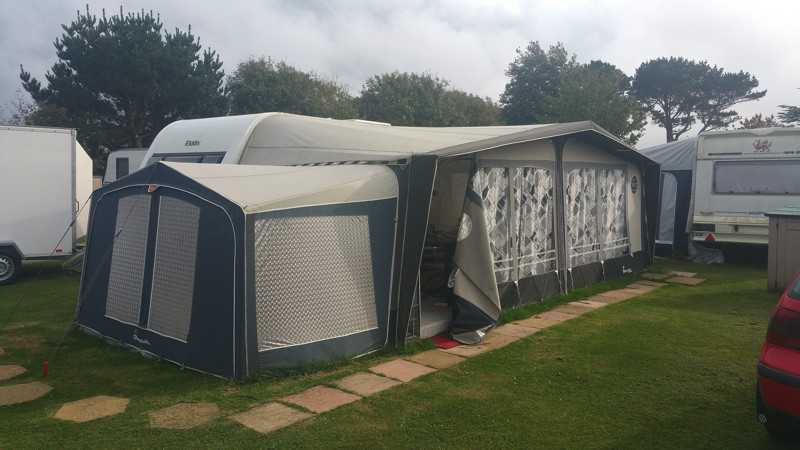 It is being sold with a number of expensive extras including a full Isabella Commodore awning with curtains, storm straps and pegs, and other extras including a Nemesis wheel clamp, Aqua Roll, Wastemaster, hook up cable, leisure battery and more. All these extras are included free and make this caravan superb value for money. It will be ready to hitch up and tow on its next exciting caravan holiday....with added Elddis luxury! This caravan has a place within our otherwise full CaSSOA gold caravan storage facility. 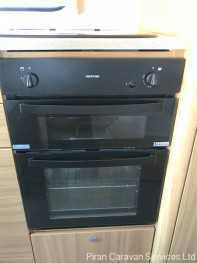 Subject to availability - please ask us.